The Peppermelon is another amazing creation from H. Joseph Ehrmann of San Fransisco's Elixir Saloon. I like this one because it not only uses a little used fruit in the cocktail world, but it also has a little spicy-sweetness with a very easy to make syrup. Watermelon juice is one of those ingredients you either have to hunt for at specialty stores or make yourself from the leftover watermelon from last night's barbecue. For the syrup, you can use as little or as much black pepper to suit your taste. I've found that a couple of turns of the pepper mill is the perfect balance of spice and sweet. Combine all ingredients in a boston shaker full of ice and shake well for 10 seconds. 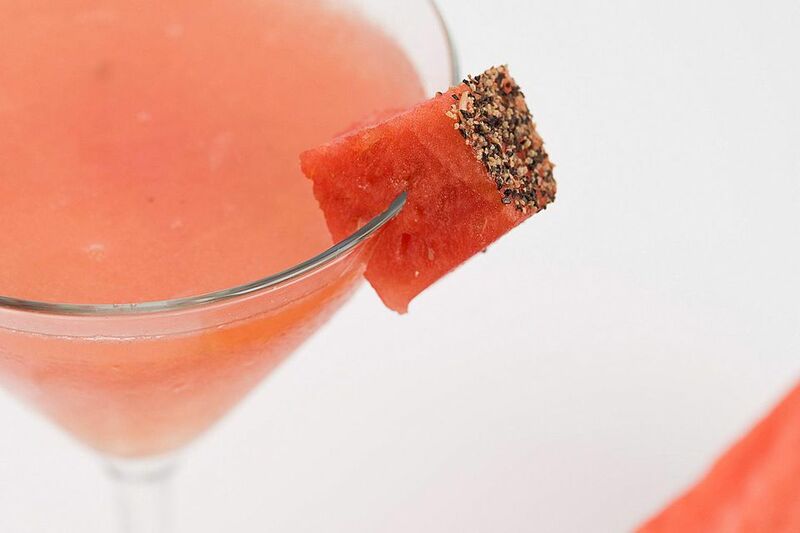 Garnish on the rim with a small watermelon cube that has a coating of black pepper on one side. *To make black pepper honey syrup: Combine 1/2 ounce each water and honey, adding crushed black pepper to taste. Mix well.